For our most important members and supporters, we're hosting a BBQ lunch and a series of free outdoor recreation classes hosted by REI's Outdoor School. Please use this website to register for those activities. You're invited to join the Georgia Conservancy for a cookout hosted by Fox Bros. BBQ and SweetWater Brewing Company at The Group Lodge at Sweetwater Creek State Park. The cookout gets started at 11:30 a.m., lunch will be served at 12:00 p.m. with remarks at 12:45 p.m. After lunch we will serve scoops of Jake's Ice Cream and lead a hike to the Mill Ruin at Sweetwater Creek. 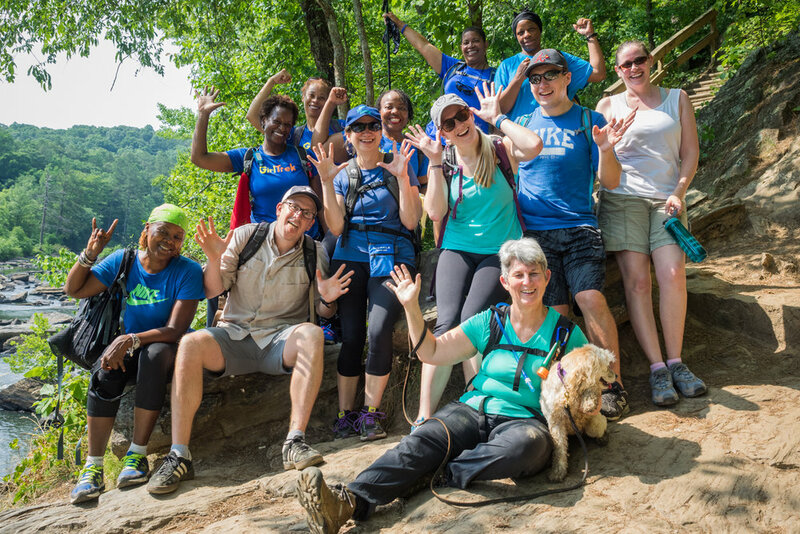 A selection of top-notch outdoor recreation classes, hosted at Sweetwater Creek State Park, provided for our most important members. For free. Come learn everything you need to know to get started in the exciting sport of Stand-Up Paddleboarding. SUP offers a great total body workout and is a great activity for lakes, rivers and the ocean. In this class, you'll learn the proper stance for balance and control, essential paddle strokes and turning techniques, as well as how to choose the right board and paddle. Courses will be held on protected water, and no experience is necessary. Come with us to learn this hybrid of surfing and paddling and find out how to walk on water! Available Times: 10:00 a.m. - 12:00 p.m., 2:00 p.m. - 4:00 p.m., 4:30 p.m. - 6:30 p.m. Available times: 9:00 a.m. - 12:00 p.m. and 2:00 p.m. - 6:00 p.m.
Why just hike or jog the local trail, or just spend time in the studio doing Yoga when you can combine the two activities to create a different way to build strength, flexibility and endurance. Join our Outdoor School Yoga & Fitness instructors for a class that will include a hike or jog along a local trail that will include a field Yoga session. We have designed the "Trail Yoga" sessions target various levels of exercise and vary in length and intensity. Check specific session details to register for the appropriate level of activity. Available times: 10:00 a.m. - 12:00 p.m. Tired of always eating the same old camp food? Heading out for your first camping or hiking trip and not sure what to pack? In this hands-on field seminar, REI Outdoor School instructors will teach you how to build a safe, efficient camp kitchen, design a menu, and prepare nutritious, tasty meals that will delight your campers and elevate your wilderness experiences! Learn about proper food handling and sanitation techniques and tips on preparing and storing your food to minimize cleanup. We will discuss what stove and fuel types are best for your needs, then we will prepare and cook a shared meal on a variety of stoves. We'll be sampling ultra-convenient freeze-dried meals, along with some of our staff's favorite camp recipes from a mix of dried and fresh ingredients that are sure to please. All stoves, kitchen materials, and food ingredients provided (with options for both vegetarians and meat eaters). Strategies for healthy, light weight, and easy to prepare meals. Learn to use camp stoves safely. Practice hands-on cooking during class. Applicable skills suitable for backpackers and car campers alike. Available Time: 2:00 p.m. - 6:00 p.m.